Home / About Wood Pellets / What is Premier Delivery? Premier Delivery involves the use of a pallet jack. 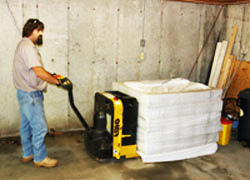 This special tool is a hand-operated machine that lifts heavy pallets, allowing delivery drivers to pull skids of fuel over flat, hard surfaces (a garage floor). Because of their maneuverability and small size, pallet jacks give you greater flexibility than forklifts to place pallets exactly where you need them. Pricing and availability for Premier Delivery varies depending on the region. There is an extra fee for this type of delivery, but many customers find it’s well worth the money. The pallet jack can move over a smooth, solid surface to place your pallets right where you need them. You just have to make sure your garage has an open, clear path in order for the driver to successfully maneuver the pallet jack. Also, it’s important to know that we cannot go down stairs or curbs, or go across grass or dirt with the pallet jack. 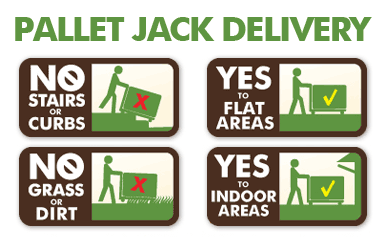 Still not sure if a pallet jack delivery is right for you? Check out our quick video below! As always, please give us a call at 1-800-PELLETS or visit us online for more information. Next article Woodpellets.com is on Pinterest!